Declined for a small business loan? Has your business been declined for a business loan? Where can you be approved? Helpful tips to follow to turn a decline into an approval. 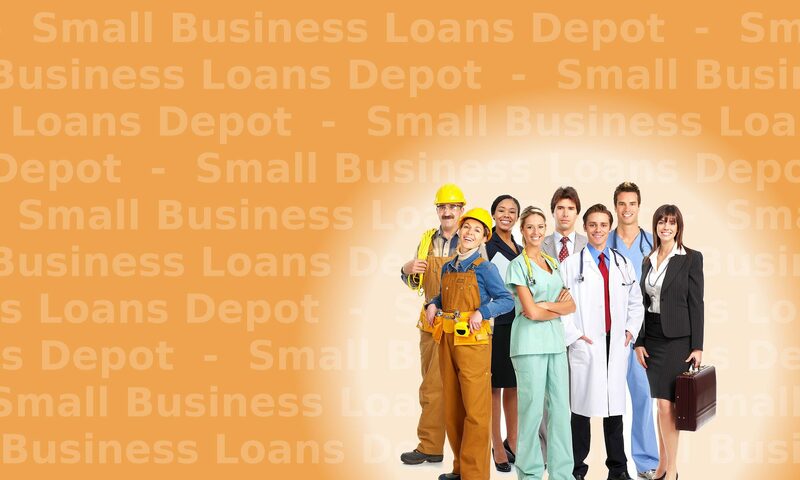 Match your business to small business loans that you will get approved for. What caused my business to be declined? What are the most common decline reasons? 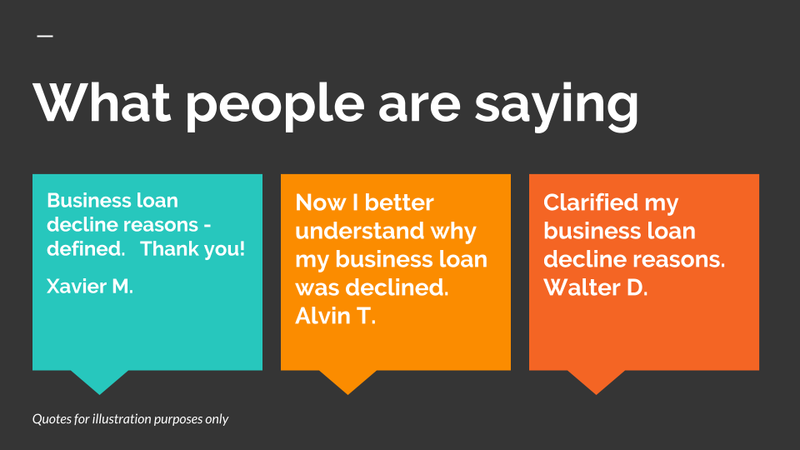 These questions and others are asked by customers and lenders. If you have been turned down for any decline reason, contact us. We specialize in difficult to approve businesses and business loans and have programs that can approve your business for any decline reason. 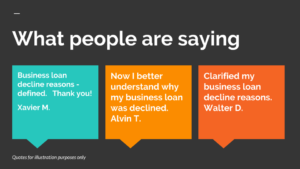 If your business has been turned down for a small business loan, the first step is to call up the company that turned you down. Determine if you are speaking with someone that has the knowledge and experience to provide you with useful information about the decline. If you received a letter, call and confirm the decline reasons. In many cases, you may have been formally turned down for more than 1 reason, and as many as 4 decline reasons. Complete the Secure DocuSign 30 Second Application now. Or call us at Tel: 1-919-771-4177, or Question? Why don’t banks lend to small business? Banks do not lend to small businesses much because small business is considered a higher risk than larger businesses. There are several reasons for this. A small business usually has to have excellent personal and business credit as well as strong collateral and financial statements. In most cases the collateral has to be a certain type that can be liquidated easily and quickly. The collateral may have to have a value between 200% and 1000% of the amount of the loan. Financial statements must show steady or increasing gross income and enough net income to service the new debt payments. Personal financial statements may need to show the net worth capacity to repay the loan if the business cannot repay from regular profit and cash flow. Smaller businesses often have not been in business as long as larger businesses. The earnings of smaller businesses usually fluctuate more than small businesses. The credit of the owner of a small business more closely reflects the level of success of the business. Small businesses have smaller relationships or no relationships with the banks they try to borrow from. Larger businesses usually have large and long standing relationships with the banks they borrow from. Banks tend to have many decline reasons for declining a small business loan. Each of those decline reasons in turn represents a review threshold that has to be met in order to be approved. Some banks have up to 50 decline reasons from which they may decline for. How can I get a successful business loan? Are sba loans easy to get? SBA loans are not easy to get. They require a great deal of paperwork to be completed. The sba paperwork includes a lot of information you have to give to the sba and many questions you must answer. Having to provide vastly more information than other lenders require gives the sba more information that can end up being a decline reason. The sba loan process takes many weeks or months. You may spend many weeks working on an sba loan only to be turned down close to the end of the process. If you are considering an sba loan then it is suggested to spend more time upfront with an sba representative discussing the process and requirements in detail before applying. You have an existing daily or weekly Merchant Cash Advance and you have missed payments on the advance. Missing daily payments is a major reason why a new loan request may be denied. Missed daily loan payments may can a renewal request to be denied. and often will not tell you. Many lenders often want at least $1,000 Average Daily Balance. Business cash flow has fluctuated too much from month to month. In some months the cash flow meets the minimum required by the program and in other months it does not. Total monthly deposits into the account have been declining from month to month. Even if the average still meets criteria, the lender may still feel this is a reason for the turndown. This is a general decline reason. If you are declined for a business loan for this reason, the lender does not want to tell you the decline reason. This a decline reason that often happens with Merchant Cash Advances. The Month to Date activity is requested for the current month. If the deposits are on track to be significantly lower in the current month, the approval be declined or the amount may be reduced. Ask if significantly lowering the amount of the request, adding a strong co-signer, or adding more collateral would cause them to reconsider and possibly approve the application. For these questions, if possible, speak directly with the credit department that makes the credit decision. If any of the reasons you are declined for a business loan involve credit, you will want to contact at least one of the credit reporting agencies to determine what is on your credit file. You may already know most of what is on your file, though you should get a copy of your file to confirm it. If there are any inaccuracies, you should dispute them with the bureau. This is easy to do and can improve your bureau without significant effort. If the bureaus cannot prove the information is accurate, you may have success in getting it removed. Once you accept what is on your credit report, begin looking for other alternative loan options. First determine what are the strengths of your business and weaknesses of your business. When you contact companies, find out as much as you can about what their alternative loan options are based on. Instead of choosing the business loans you like best, organize the loan types in terms of what your business is most likely to qualify for. Of those loan options, then decide which ones you believe you should proceed on. Discuss the loan options with the representative and speak with someone who is knowledgeable, rather than someone reading from a script. If they don’t give you logical answers to your thoughts or concerns, try to speak with someone else. Don’t feel that you must get all the funds you need through 1 type of loan, or all of it immediately at that time. There may be 2 loan types that you should proceed on. If your business needs $100,000 in total, and you only qualify for $50,000, this may still work by getting the funding in segments over time. You can take the $50,000 you qualified for and also work on getting the rest of the funding required over the course of the next few weeks or months. Chances are you did not need the entire $100,000 immediately. Most businesses that receive $100,000 do not spend it all within the first 30 days. If your business has been declined for a business loan, many of these steps will be important to getting approved. also visit the SBA. The SBA government site has numerous resources which can assist your business. 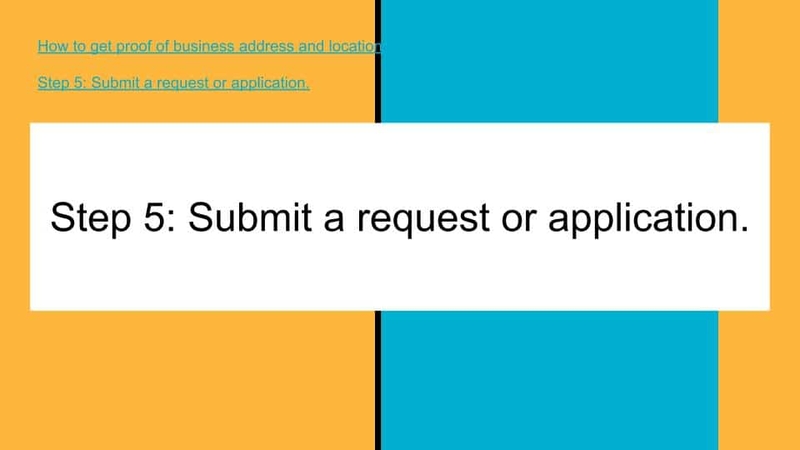 Thank you for visiting our resource page on what to do if you are declined for a business loan.